Years of underinvestment, unreliable services, dirty trains and stations, plus high levels of fare evasion and difficult industrial relations left Merseyrail with a dire reputation. But when Merseytravel took over the management of the 25-year concession in 2003, things began to change, and the Liverpool-based operator has transformed the network in the intervening years. Now, on an average weekday, the operator runs 800 trains and carries more than 100,000 passengers, through 66 stations, six of which are underground. Covering 120km of track, the network is one of the most intensively used in the UK. NRA judges said that Merseyrail has shown clear evidence of maintaining excellent levels of customer service, even during a period of major track renewal works on the Wirral Loop line and also during the first phase of the Liverpool Lime Street upgrade project. During that work, other operators’ main line services began and terminated at Liverpool South Parkway, and from there it was Merseyrail’s responsibility to transport an additional 150,000 passengers into and out of the city centre. All of these objectives were achieved. High levels of punctuality and reliability underpin Merseyrail’s customer service with a moving annual average Public Performance Measure (PPM) of 94.9% and a Cancellations and Significant Lateness (CaSL) figure of just 2%. Importantly, the operator takes its responsibilities in the local community very seriously and proactively engages with it in many ways. This involves arranging a very successful safety education programme in schools and also arranging enhanced train service levels for big sports and leisure events that are held in Merseyside. In Transport Focus’ most recent National Rail Passenger Survey (NRPS), Merseyrail achieved an impressive 92% satisfaction result. 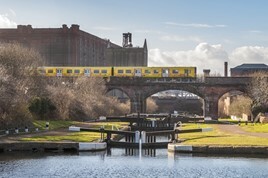 The judges said that, while Merseyrail is regularly one of the leading contenders for this award, this year’s entry was particularly strong, winning them the major accolade.